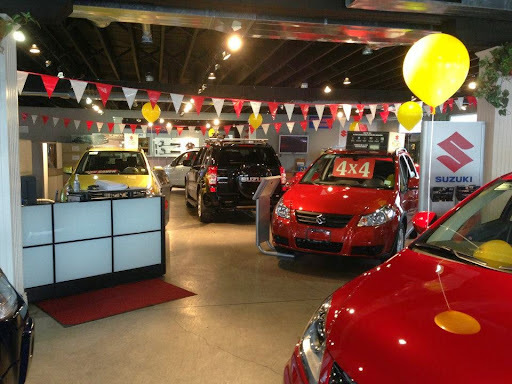 After dealing with guys from Richmond Suzuki, I will not recommend any one to get near that place, and thats why: Unfortunately I bought a used car from them. Besides the price of the vehicle, the nice fellow charged me additional fees of over 1000$ for "documentation fee", and some other fees. He explained me that the vehicle is going through a strict examination by their mechanical crew, and thats why I have to pay them some extra money. So I did. A couple of days in to my purchase, the car started shaking really bad. I went back to "Suzuki Richmond", and guess what? "Sir, your brakes are weared out" So, I have paid you a good amount of money because you promised the car is being inspected before purchase, and now this? Im driving that car with my wife and two kids, and you are putting me on the road with bad brakes? I guess they understood that this aint looking good, so they replaced my brakes, and of I went. A month and a week into my car ownership, and a loud noise started from under the Hood. Now when I bought the car, the salesmen "gifted" me with a 3 months warranty on the engine and on the transmission. I first went to a local mechanic shop (Midas). They examined the vehicle and diagnosed it with a Motor problem. I called "Richmond Suzuki", and the guy told me to come down. On my way the "check engine" light went on. So I was pretty sure that my warranty will take care of me, and didnt suspected at all what came next. After checking the car, this is what I got from them: 1 - the "check engine" light went on because the spark plugs are damaged. 2 - We dont know what the source of the noise is, it can be engine or something else. Ok, so I told them great, I have warranty, so fix it please. And that is what I got in response: Apparently, the warranty comes with different levels of liability (the salesmen didnt mentioned it at all). Mine was the simplest one, and would be valid if the engine will completely die. Noises, minor malfunctions and so werent covered. Apparently I could purchase a better warranty coverage, but the salesmen "neglected" to mention it during the sale. So, I asked them to provide me with some solution to the problem - fix the car/return the car/replace the car. I was ready to add extra money and to upgrade to a newer car, as long as they will trade in my car for what I paid for it. They wouldnt do nothing. To fix the car they demanded a lot of money. For the sparks they wanted to charge me 350$ (I replaced it in other garage on 3rd st for 120$). For the noise they said that only the evaluation will cost me a couple of hundred bucks. Obviously they wouldnt return the car, and even to upgrade it they would give me only part of what I paid for the car. So basically "Richmond Suzuki" did a number on me. My 2008 Suzuki SX4 was purchased May 23 2008 and ever since from Day 1 it was serviced by this dealership till 50,000 Km and slightly over 3 years by then. After year 1 , the auto sphenoid not working . this dealership did not know how to check it even I left this SX4 to them for a solid 7 days trial. Finally I went to Jim Patterson Kingsway Burnaby and this dealership got it right and told me the problem. It took me 3 months to get it fixed and replaced . Suzuki Canada is also not very effecient at all! year 2 : my air conditioner not cool; dealership not their duty to check it. It was checked by an outside mechanic that the condensor leaked! I got it replaced elsewhere as this dealer said not their problem ! Canada Suzuki was equally not helpful at all! Year 3 : water pump slowly leaking and was advised by my mechanic friend. I reported the problem to this dealership, they said over 3 years, out of warranty. So I trust them. I repalced it on my own expenses. Just a week ago, I chercked the limited Power train warranty , water pum should be covered as it is deemed to be part of the lmited power train warrantly under 5 years or within 100,000 km! This dealer service advisor and the dealer mechanic all said it was with 3 years! to have it replaced! B.S. totally un professional.and negligent. Year 4 : My mechanic friend told me that the transmission differentials leaking and wet, On Dec 8 2012 I brought the SX4 to this dealership and told them this problem and showed them the warrantly wordings, they hoisted it iup on Monday Dec10 2012 and took a picture and called me on Wednesday that it was only normal that this part is wet approx. 6 inches by 4 inches because it has run for 4 yaers Plus and 71,000 km. and most impotantly it was not dripping. Hence, No warranty kicks in. No repair !! So, I took it to another dealer , this dealer says yes, it is underw warranty and it is leaking , otherwise, how would this area be wet !! So Do not trust this Dealership at all. Even they tell U free oil changes for life! Canada Suzuki is not helpful at all. They only tell u to go back to their dearlship people. If you are dealing with XYZ..., totalyy incapable and idiots, what good is your world best warranty? Please share it. my actual experience. I would not buy another Suzuki. and do not deal with this A.H. Terrible experience!! I went to view a Subaru Impreza recently. Took the car for a test drive, was informed about the basic price, the taxes, and the documentation fees ($895). I went through the finance plan with Anna Schellenberg so that I knew what I was dealing with. My only real concern at this point was regarding some minor scratches and dents to the vehicle, which they said they would have polished up. I agreed to come back in a few days (with my girlfriend) to view the car again. All was good, and to be fair – they did an excellent job of cleaning her up. But then it was on to financing again, which is where everything went south. Somehow an extra $800 had been added for “Finance fees”, which I was told the banks receive. Essentially the fees on top of the cost of the car and taxes were now in excess of $1600!! Despite saying she operated under “full disclosure” – this cost was not revealed to me until the very last minute! When I said I would be looking to the banks for a loan instead (the banks told me they don’t charge any such “finance fee”) I was told that we would have to renegotiate the entire cost of the vehicle in that case. Auto Direct are obviously getting a cut of the financing in that case, which they had also not disclosed to me (shocking!). Complete scam! At this point the trust was gone and the deal was over. Never again, avoid, avoid, AVOID!! Definitely not recommended. I bought a Suzuki Aerio from them in July 2012 with 120k on it. The next day I took it for another inspection at a reliable mechanic and was told that it should never have passed the safety. I went back to this dealership and was told essentially too bad. First I had to replace the brakes because they were so rusted out. Then the oil pan which was also completely rusted and full of pin-size holes. Then the 5th gear assembly. Then the computer dash display stopped working. This was all within 3 months of owning the car. I will accept full responsibility for not knowing any better and buying such an unsafe car; but I do think it was underhanded to sell a car with faulty brakes and an oil pan that was about to fall apart yet claim that it had passed the safety inspection. I finally had to cut my losses and sell the car as scrap (after the front wheel came out of the ball joint while I was driving - could have caused an accident) and am looking to buy a brand new car from a reputable dealership (I should have paid attention when I first read the reviews for this place). If you go here definitely take a mechanic friend with you. The used car salesman stereotype applies here.